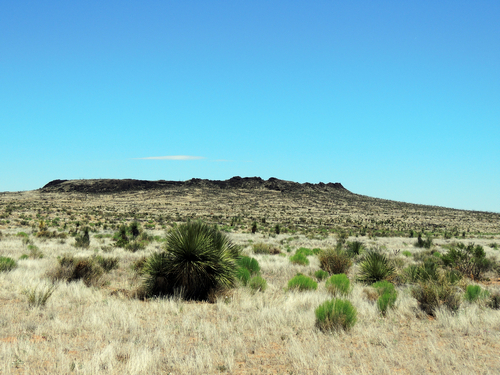 Kilbourne Hole is only one feature of the Potrillo Volcanic Field south of Las Cruces, but it is the best known. Desert USA says: Exploring the Potrillo Volcanic Field – a 500-square-mile Chihuahuan Desert landscape of lava flows, cinder and shield cones, immense craters, structural fracturing, low and sullen mountains, depositional and wind-blown sands, playa lakes, cacti and scrub brush – you feel that you can touch the pulse of our restless planet. 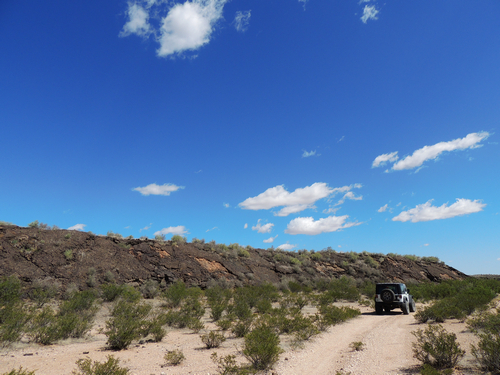 This Jeep trail will take you to the leading edge of an ancient lava flow, inside a volcanic crater that is above the level of the desert and to the bottom of two volcanic craters that are below the level of the desert. This area is vast and empty - you may not see another person all day. 85 miles from I-10 to I-10, but much of it is fairly fast travel. The trail is easy enough to be run in either direction, but will be described from north to south. As you head south along the railroad tracks, keep watch on the right for a distant view of Aden Crater on the horizon. This will be a major stop later, but first continue along the railroad tracks and go beyond the crater. A short road to the right will take you to a spot where you are surrounded on three sides by the edge of the Aden Lava Flow. In some places, molten rock intruded into depositional sand but failed to erupt through the surface, leaving it to the forces of erosion to strip away the overburden, exposing igneous formations. In other places, molten rock erupted violently, explosively, ejecting clouds of congealed lava that fell back to earth as cinder, forming a cone around the vent. In some instances, it erupted over time as a succession of lava flows from a single vent or clustered vents, forming wide-spread basalt layers that took on the form of a Roman warrior’s shield lying flat on the sand, its battle side up. In some spectacular events, molten rock came into contact with the water-saturated sands left by the ancestral Rio Grande. It produced superheated and highly pressurized steam that exploded through the earth’s surface with monumental force, creating large craters that geologists call “maars” or lakes. These holes in the face of the Aden Lava Flow may have been lava tubes that collapsed as the lava drained out and the flow cooled. Note the thickness of the field using the Jeep as comparison. You are almost surrounded by the flow. A shield volcano is a type of volcano usually built almost entirely of fluid magma flows. They are named for their large size and low profile, resembling a warrior's shield lying on the ground. This is caused by the highly fluid lava they erupt, which travels farther than lava erupted from stratovolcanoes. This results in the steady accumulation of broad sheets of lava, building up the shield volcano's distinctive form. Aden Crater is a shield volcano. Strangely, back in the 1960s, investigators exploring Aden Crater found a fumarole – a vent through which gasses escaped – with the desiccated remains of a giant ground sloth. It had lived in the region near the end of the last Ice Age, roughly 11,000 years ago, during the same time that bands of nomads hunted big game of the area. Somehow, it had fallen into the vent to its death. 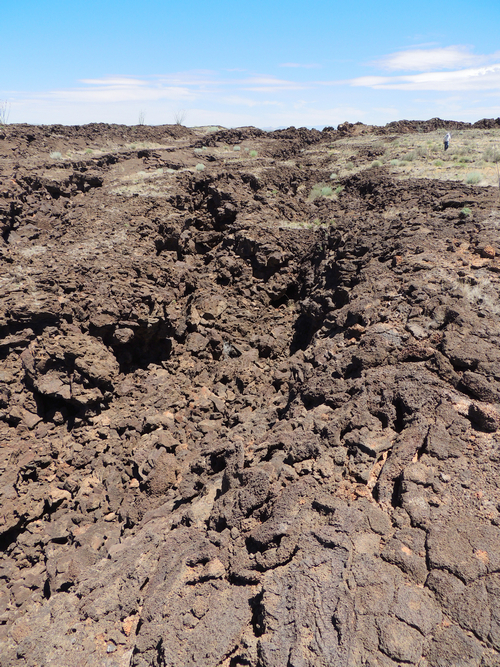 You can find what we think are collapsed lava tubes within the crater itself. Photo. If you have a low clearance vehicle you should park at the base of the crater and hike up to it. If you have sufficient clearance you can drive up to the crater and make a circle inside it by following this track. Take time to explore. We understand the sloth fumarole is just under the rim on the eastern edge - we did not look for it. 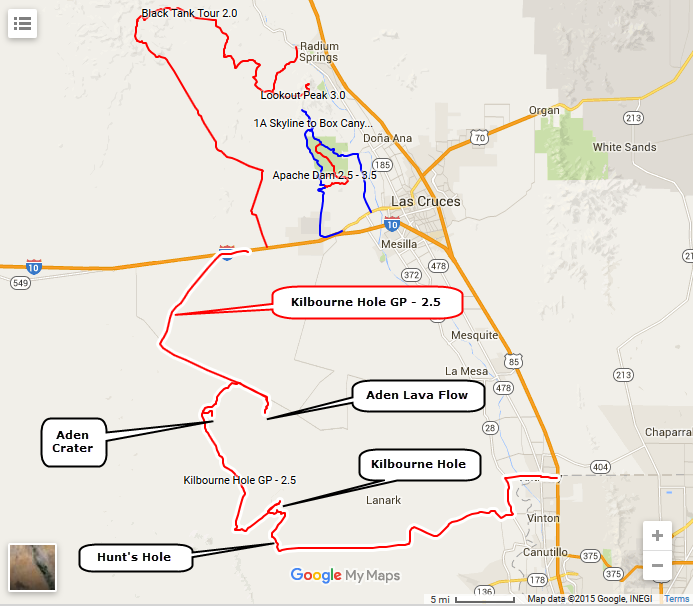 From here you drop south toward Kilbourne Hole. 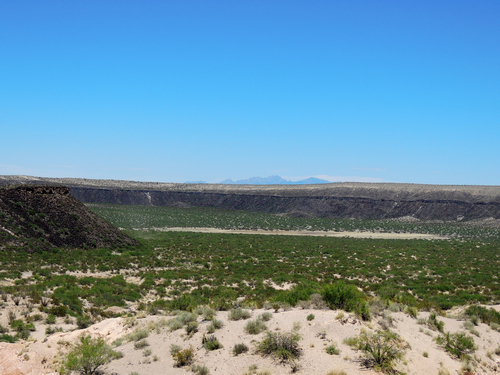 One of the largest, best-preserved maar volcanoes in the world, Kilbourne Hole, which formed between 24,000 and 100,000 years ago, extends for about two miles in length and about a mile in width. Its bottom lies several hundred feet below the surrounding desert floor. Early on, its unusual appearance led some people to speculate that it had been caused by a meteorite that crashed into earth and rebounded, like a tennis ball, back into space. 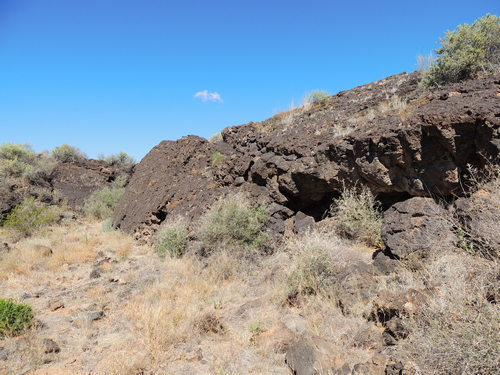 Compared with volcanoes like Aden Crater, which developed over time, Kilbourne Hole appeared with great suddenness when the superheated steam produced by magma and subterranean water blasted some 500 million cubic yards of sand, rock fragments and shattered basalt into the sky. The explosion, according to Earl M. P. Lovejoy, El Paso’s Geologic Past, produced a funnel-shaped crater. Much of the blast material fell back into the crater, refilling much of the void. Other material fell around the crater lip, forming a rim. Subsequently, in what was probably a series of “staccatolike eruptions,” according to Hoffer, clouds of steam, ejected material and debris combined to construct “a rampart of stratified tuffs [consolidated volcanic ash].” The rampart is sometimes described as a “festooned dune” because its stratified layers look something like festoons billowing in the wind. After the explosions ended, the walls slumped into the crater, widening its diameter, and winds deposited sand dunes around the rim. You can follow this track and descend to the floor of the crater. Use caution. The descent was rated a strong 2.5 at the time we were there, but the highly erosive hill could easily become worse. Among rock hounds, Kilbourne Hole is renowned for its “volcanic bombs,” or xenoliths, which encase olivine crystals and, with extremely good luck, gem-quality peridot. A volcanic bomb begins as a “glob” of liquid lava blown from the crater vent into the air. It cools and begins solidifying while airborne. If still sufficiently pliable when it falls back to earth, it may take on a roughly spherical shape as it tumbles over the surface. Within Kilbourne Hole’s volcanic bombs, the mineral olivine forms greenish or yellowish transparent or translucent crystals, sometimes of high enough quality to be considered a peridot. 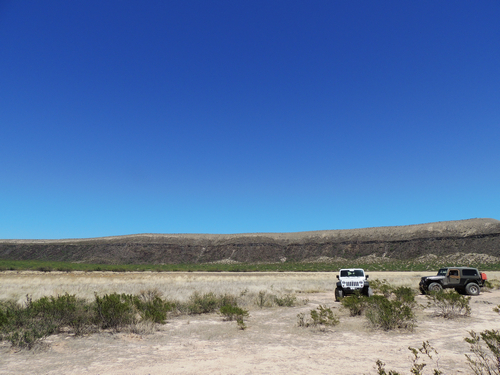 While volcanic bombs and olivine occur in one of the other maar volcanoes in the Potrillo Volcanic Field, you will find that they are most abundant in Kilbourne Hole, primarily in the vents at the north and south ends of the crater. Head east from here, following the track along the edge of the crater for a mile and a half. If time is short you can skip this portion and take the graded road until it intersects the track again. At this intersection head southwest toward Hunt's Hole. Hunt's Hole is another maar volcano. There is a 2.5 rated section that takes you down into the crater on the west side and brings you back out on the south side. This one is not as difficult as the one in Kilbourne Hole. It can be bypassed by taking the graded road around the rim. 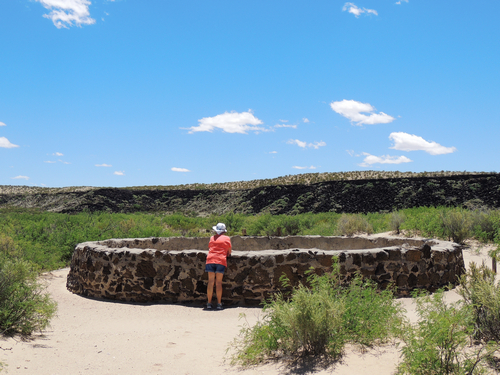 There is a very interesting stone cistern on the crater floor. It is all smooth sailing from here to I-10 at Anthony.